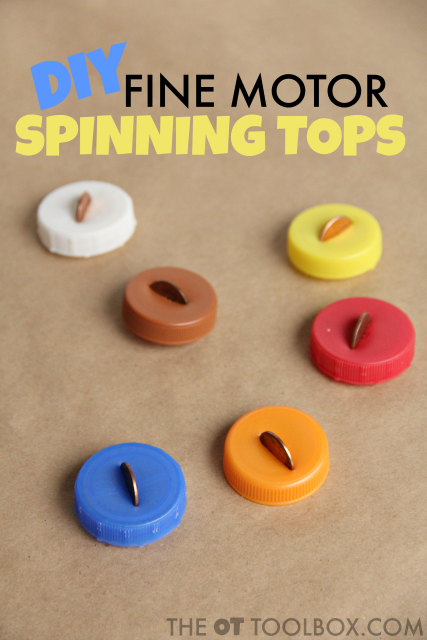 These little DIY spinning tops were a big hit in our house. These are a different way to work on a few fine motor skills needed for use in functional grasp patterns. The best thing about these tops is the price. 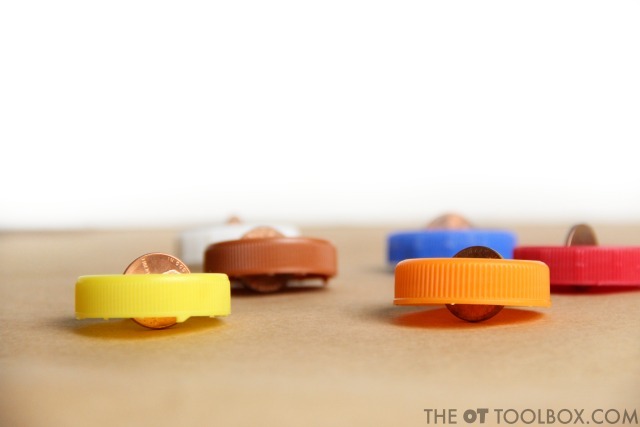 It takes just a few pennies and some recycled bottle tops to make a set of spinning tops that can be tossed into a therapy bag or used in a home program. Work on skills such as pincer grasp, in-hand manipulation, arch development, and eye-hand coordination just by spinning a top! These tops are very easy to make. It does take a little planning. You'll need a handful of recycled bottle caps to make a set of tops. You can certainly make just one, but what fun is a spinning top battle with just a lone top? If your family is like mine, you go through a couple of gallon sized containers in a short period of time. Between milk, juice, iced tea, and water, it doesn't take long to round up a handful of bottle caps. Next, use the sharp knife to press strait down into the lid of a bottle cap. Firmly hold the bottle cap on a cutting board and press the knife strait down to make a slit in the lid. This is a definite task for adults. Be sure to make the slit only wide enough for a penny to fit into the slot. And that's it! Your spinning tops are complete. 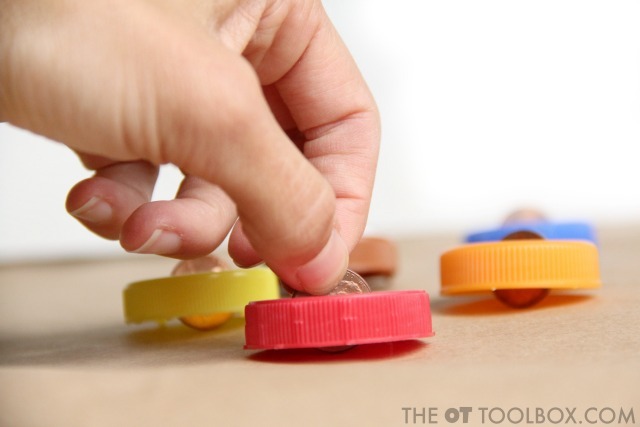 Tops are a common tool for improving fine motor skills. When you spin a tip, you are challenging and building in-hand manipulation skills. When spinning a top, a child is required to rotate the top between the pads of the thumb and pointer finger in order to make the top spin. This is termed simple rotation and a skill that is needed for manipulating items with in the hand. When a child writes with a pencil, they need to manipulation and use the pencil with one hand. Read more about the different types of in-hand manipulation. 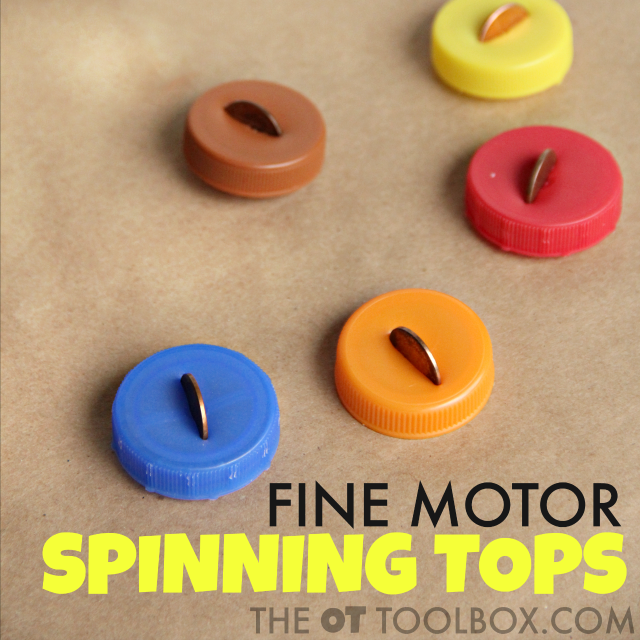 These tops are a real fine motor power tool with the small flat surface that the penny provides for spinning. This is a great way to encourage a neat pincer grasp and dexterity. Spin several of the tops at once. Try to keep all of the tops spinning. When one starts to stop, spin it to catch up with the other tops. Draw a square on a large piece of paper. Try to keep the spinning tops inside the square. Spin a top on a large platter. Walk across the room without allowing the top to fall. Challenge another child to a top spinning challenge. Each child can spin 2-3 tops of a single color. When a top stops spinning, that top is out. The child with the last spinning top is the winner. One warning about these tops: Be sure to use them under strict observation. 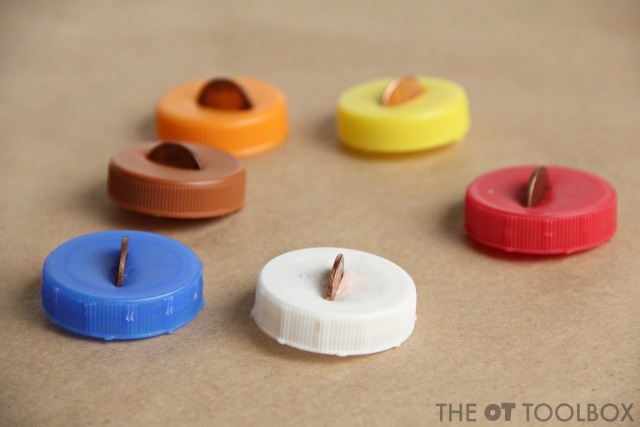 Pennies are a choking hazard and these tops should be used only under supervision.